With living walls and a water reclamation system, Galileo’s Pavilion takes “green building” to a whole new level. Johnson County Community College’s Galileo’s Pavilion is a breath of fresh air … literally. Known for its “living walls,” the 3,000-square-foot building takes “green building” to a whole new level. The inspired learning space that is Galileo’s Pavilion was designed and constructed by students enrolled in Studio 804, a fifth-year, graduate-level design studio offered by the University of Kansas School of Architecture & Design. 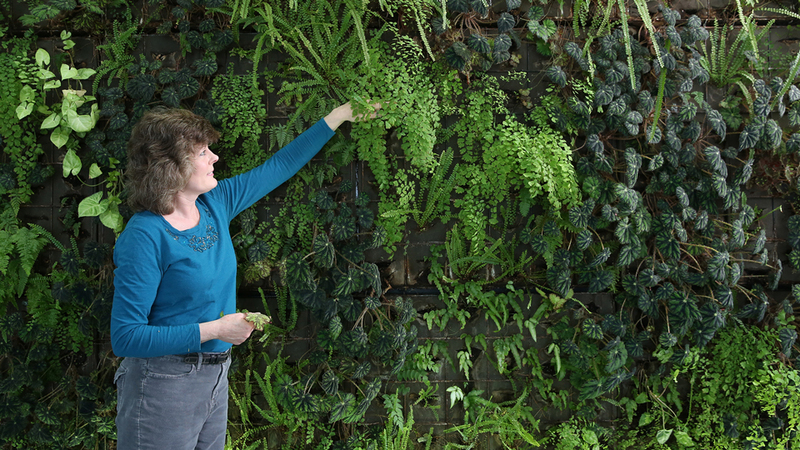 The living walls in Galileo’s Pavilion are composed of approximately 10 different tropical plant species, including fern varieties and rex begonia. In addition to their aesthetic charm, the plants help improve indoor air quality and enhance the acoustics of the spaces. These benefits and more are made possible through the work of JCCC’s Garden Keeper, Katie Sadler, who visits campus twice a week to dust, trim and divide the plants. Sadler also adds new plants as needed. Because Galileo’s Pavilion was built with sustainability top-of-mind, its various features work together to create a green masterpiece. The facility’s water reclamation efforts are a prime example of this. Rainwater is collected from the roof, diverted to an underground 1,700-gallon cistern and filtered. Then the water is used to irrigate the living walls as well as supply the flush-valve toilets and urinal. This helps reduce potable water demands and stormwater runoff. Stormwater runoff not collected in the cistern is retained in a rain garden near Galileo’s Pavilion. These sustainability features contributed to Galileo’s Pavilion becoming a Leadership in Energy and Environmental Design (LEED) certified building. Developed by the United States Green Building Council, LEED is the most widely used green building rating system in the world. Galileo’s Pavilion received a platinum certification – the highest LEED rating available and a great honor for JCCC and Studio 804. When it comes to JCCC’s sustainability efforts, Galileo’s Pavilion is just the tip of the iceberg. The College’s commitment to sustainability extends to every corner of campus. Learn about all the ways sustainability is integrated into campus life at the Center for Sustainability website.